That day is almost here. You’ve been waiting for months – possibly years. It’s time to take off your braces! No doubt you’ll rejoice once you unshackle your teeth from those bands and brackets. But you know it’s time to move on to the next step – namely, the use of a retainer. But why do you even need a retainer? And what do you need to know about the world of retainers? Over the past several months, your orthodontic device has gradually moved your periodontal ligaments, that network of fibers that hold your teeth in place. However, it takes several more months for these ligaments to adjust to their new position. Without a proper retainer, your teeth would drift back over time. Typically, you will be fitted for a retainer on the same day your braces are removed. After thoroughly cleaning your teeth, your Yuba City Dentist will take X-rays and an impression of your bite to analyze the new position of your teeth and to check the development of your wisdom teeth. Then, your dentist or dental technician will prepare your new retainer. Generally speaking, there are three types of retainers available. Your particular situation will dictate which one is the best choice for you. “Hawley”: The Hawley is the simplest of the three retainer types. It is a thin, tongue shaped piece of acrylic that is molded to fit your mouth, with a wire that holds your teeth in the proper position. Hawley retainers are simple and durable, and often even adjustable. They can be personalized for younger patients by means of different colors and designs. 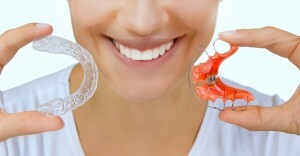 Clear aligner: This type of retainer is custom-made of thin, transparent plastic. It looks similar to the Invisalign® tray system, and is designed to fit precisely over your teeth to keep them in place. Clear aligners are very popular because they are easy to remove and less noticeable than Hawleys, but they are also less durable. If you grind your teeth, the clear aligner may not be the retainer for you. Fixed retainer: This type of retainer uses a wire that across the back side of teeth, usually bonded in place with a special cement. The retainer is truly fixed; it cannot be removed by the wearer and will typically remain in place for several months (or longer). Fixed retainers typically produce the best outcomes since they are always at work – holding the newly straightened teeth to their new position. Typically, for the first several months (or even up to a year), you will be instructed to wear your retainer all the time. Your dentist will instruct you to gradually reduce the use of the retainer, until you are only wearing it a few nights a week. A retainer case will help you to keep track of your new device. Also, be sure not to expose your retainer to excessive heat (e.g., washing it in very hot water or leaving it next to a hot surface), which may cause your retainer to warp and render it unusable. Make sure to take care of your retainer, and it will take care of you – in the form of keeping your teeth straight and your smile looking great – for years to come.